First Impressions is IICRC certified in upholstery cleaning and is recognized as one of the most educated and experienced upholstery care companies in the Orlando, Central Florida area. Upon a thorough inspection, our certified technicians will determine the proper cleaning procedure for your specific needs. We can apply Bridgepoint's Maxim Fine Fabric Protector to ensure your fine fabrics continue to have lasting beauty between cleanings. From heavily soiled to light cleaning, our 11 step cleaning process is designed to restore your furniture as close to its original condition as possible. 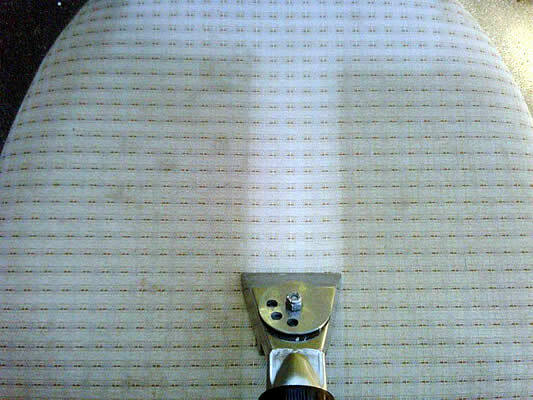 We can clean all types of upholstery, even the most delicate of fabrics. Our 11 Step Cleaning Process For Upholstery. Pre-inspection – Our service technician will inspect the furniture, noting fabric type and soiling conditions. He will also advise you of any possible permanent staining. Pre-vacuum – Your upholstery will be vacuumed if needed. Floor Protection – If needed, your hard surface floors will be protected with an absorbent material to ensure we do not drip or over spray as we clean the upholstery. Pre-spray & Pre-Spot – The fabric is “pre-sprayed” with special cleaning compounds specially designed for your particular fabric& soil condition. This loosens up the soil to make rinsing more effective. Pre-Agitate – If needed for heavily soiled arms and cushions, the pre-spray will be worked into the fabric with a horsehair brush, specially designed for this use. Rinse & Extract – Once the soil has been loosened, we will thoroughly flush the fabric with our specially designed upholstery extraction tools. This step removes soil from the fabric and leaves your fabric soft and residue free. Post Spot Treatment – If any spots are not removed during the cleaning process, specialty-spotting techniques are employed. Speed Dry – High velocity air movers are set in place to speed dry the upholstery. Fabric Protector - Apply a solvent based protector to repell oily soils and drink spills. Post Grooming – If the fabric has a knap, the knap is set in one direction using a grooming brush. Post Inspection – Piece is inspected by technician & then by you the homeowner during our post inspection. Let us know that you are pleased by signing our service receipt.